Nadrazi Praha-Holesovice is the second train station in Prague. 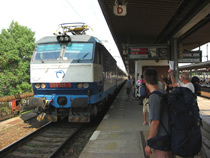 International arrivals from the North and the West often use this terminus, such as trains from Berlin and Dresden. Whereas the main train station in Prague, Praha hlavni nadrazi, is in the city centre, Nadrazi Praha-Holesovice is just outside. But it is well served by trams and the metro. The metro station at Nadrazi Praha-Holesovice is Nadrazi Holesovice (line C), which is 4 stops from Muzeum metro station at Wenceslas Square. The tram journey time to either Wenceslas Square or the Old Town is 15 minutes. The Lesser Town is 10 minutes away. Alternatively, buy tickets in advance or on the day of travel from Nadrazi Praha-Holesovice. Tickets are generally available to national and international destinations right up until the time of travel.